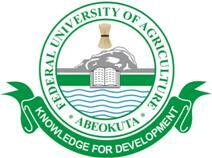 Federal University of Agriculture, Abeokuta, (FUNAAB) Postgraduate Diplomas, Masters and Doctor of Philosophy Degree Programmes / Courses Offered for 2018/2019 Academic Session. Recommended: FUNAAB Postgraduate Admission Form is Out 2018/2019 [Click here to Apply]. (iii) Wildlife Park Planning & Recreational Development. (iii) Medical Microbiology & Public Health. MVPTMaster of Veterinary Pharmacy and Therapeutics (Professional).